Simple: the new Post Format function emulates Tumblr style posts. Using post_format template tags with conditional statements, you can exclude or include a post’s contents. It all depends on what you want that particular post format to display. Essentially, it’s meta information attached to posts to allow themes to present posts differently than just the standard way. They’re pre-defined and cannot be extended (developers cannot add new ones). The [intlink id=”2582″ type=”post”]Post Formats[/intlink] feature provides a standardized list of formats that are available to all themes that support the feature. As of [intlink id=”2582″ type=”post”]WordPress 3.1[/intlink], you’ll have the option of nine (9) separate post formats. Similar to Tumblr, you’ll be able to share almost anything in an effortless manner: Aside, Gallery, Link, Image, Quote, Status, Video, Audio or Chat. So, when you find a quote you want to share on your blog, then post it as a Quote. You just took an image you want everyone to see, then post it as an Image, and so on. Each can have their own unique styling. Users can choose a post format when editing posts. Portable* – changing your theme will not break your website. Especially good for themers. Post Quickly – Designed to share posts regardless of size. Microblogging – More versatile, allowing posting of short twitter-like blurbs or large articles. Less Confusion – your blog readers and contributors will know exactly what type of post they are currently looking at since ideally each format will be uniquely styled. Visually More Interesting – you can present each post [format] with a distinct a layout. Prior to WordPress 3.1 all posts are displayed with the same basic layout. NOT required to support every format on the list. New formats (other than nine predefined formats) cannot be introduced by themes or plugins. Here are the nine predefined formats which offer a general guideline to what how post can be displayed. Aside – Similar to Facebook note update. Short notes, usually without a title. Quote – A quote. Maybe a blockquote holding the quote content. Alternatively, the quote may be just the content, with the source/author being the title. Status – Status update similar to a Twitter status update. What can be “Customized” with the new feature? A great example of Tumblr style WordPress theme: Shelf Theme. By far, the simplest explanation I found of what Post Formats is. ** Post Types is poorly named. It should be more like Custom Content Types like attachments, menu items, pages, posts. However, they are not Posts. They do not show up on the Blog portion of your site. They do not appear in the Posts Feed. However you can create special feeds for Post Types. Also, custom Post Types is a way for plugins to define types of content for themselves. Well documented. I wonder if the post formats (status, video, image, gallery, etc) will effectively equal the name of the categories for these type posts, or can they be called something differently? For example, on the Wumblr theme it seems they are using some of the post format names as the category names, but at the same time some of their posts (with that “post format” design) carry category labels that differ from the 9 standard post formats. Do you know how this works in that respect? Also, I find it hard to picture what “custom post types” (yes, I know they should be called “custom CONTENT types”) are exactly for….okay they are NOT for the blog section of a website, but how exactly would they be used? And would a plugin offer that functionality, or WP or the theme? Is that something for ecommerce driven WP sites perhaps? To preface: Post Formats were introduced as a standardization for theme designers. Best way to get the concept behind post formats is to set up an account at tumblr. Post Formats simplify the sharing/posting process, parring down the contents (e.g. title, content, etc,) of different types of posts (e.g. quotes, images, links, etc.). The thinking (I assume) is to make WordPress more micro-blogging capable. Thanks for your comment. Your explanation stands unique on Post Formats and saved lots of my time. 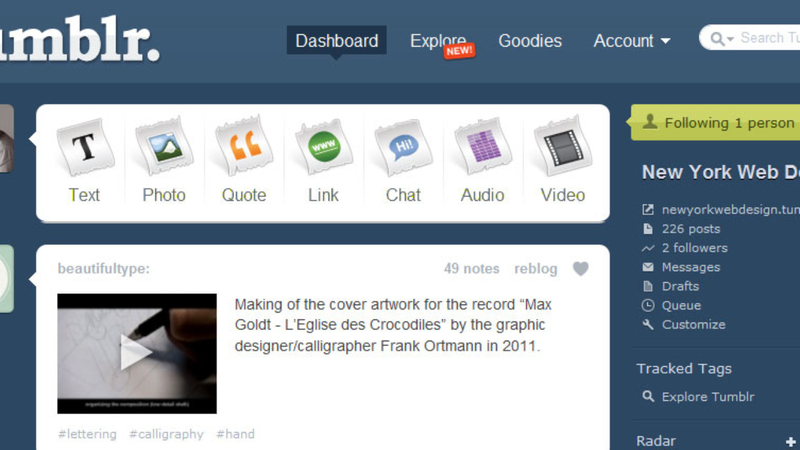 Hope with Status Post Format i can have my (twitter like) updates in my own blog in a page or sidebar. If you write on doing so will be more helpful.